THE GOAL OF INITIAL DETECTION AND REVIEW OF PEPTIDES IN H20 SAMPLES IS TO REMOVE UNIDENTIFIED OR REDUNDANT PEPTIDES FROM THE PEPTIDE LIST FOR HDX DETECTION. IF THE PEPTIDES ARE NOT FOUND IN THE UNDEUTERATED SAMPLES THEY USUALLY WON’T BE IN THE ON EXCHANGE SAMPLES. 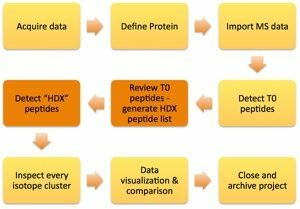 HERE WE WANT TO REMOVE INSPECT AND SELECT A REDUCED LIST PEPTIDES FOR HDX DETECTION TO SAVE TIME DOWN THE ROAD. HDX Workbench is an established feature rich software platform for the analysis of hydrogen/deuterium exchange (HDX) mass spectrometry data from Waters or Thermo instruments. Allowing users to quickly calculate deuteration levels for peptides, it integrates intuitive visualization tools to provides everything you need to understand and report protein conformation in the presence of HDX.